Thanks; looking forward to the continuation. Plus the anomalies in island and viscount. It could be spelling pronunciation. It could be an analogy with floral. It could be knowledge of Latin — your own, or that of influential teachers. Crystals' point was that consonants weren't doubled before -id there was never a spelling timmid. So, whether there was a short O or a long O the Latin single consonant was left unchanged. Crystal recounts how some writers tried to be consistent with commet, plannet etc. They were not copied. I can see how most writers and printers would have dismissed them as just silly. Every literate person knew Latin, so it would just confuse them to insert consonants. Crystal's central message is that English spelling is learnable. Concentrating on the anomalies makes it harder. Concentrating on regularities makes it easier to learn — even if the regularities were imposed when people shared different experience and a different mindset. Crystal's central message is that English spelling is learnable. That reminds me of this page by Mark Rosenfelder (a.k.a. Zompist), known for his conlanging. It's great for people with a modicum of phonetics training and with the ability and inclination to master Rosenfelder's notation. For the average punter, it's not really learnable. What Crystal proposes is both less ambitious (There's no attempt at a system) and more ambitious (it addresses symbol-t-sound and sound-to-symbol equally). The strength of the book is that it identifies the many regularities in English spelling, putting them in memorable narratives both historical and situational. The historical narrative is based on events like the Norman Conquest, the invention of printing, the Great Vowel shift. The situational narrative is based on imagining what was in the mind of individuals who combined to start new trends. The narratives, if taught effectively, allow the learner to associate the spelling and the spoken word. This association works both ways: it allows the reader to recognise the corresponding spoken word, and it allows the writer to get the conventional spelling right. Rosenfelder's rules correspond to Crystal's narratives, but they don't usually offer any insight into how, when and why they came to exist (a great plus for learnability). Moreover, they're much better at procedures for deciphering symbol-to-sound than they are for remembering the sound-to-symbol spelling. 2. In English, iland was re-analysed as isle + land, and the spelling was adjusted accordingly. Crystal doesn't write about viscount but I think it's a simple case of the pronunciation changing. In French they changed the spelling to match the new pronunciation, but in English we didn't. John, your last paragraph seems to place the insertion of P into debt and receipt quite late in the history of spelling. Rather, it's the other way round. It's the loss of P in deceit that came later. According to the OED, both Old French and Middle English had spellings with and without P. The word conceit was coined in English presumably on the analogy of deceit. Purely by chance, it chose the spelling without P.
For she began to axe him streit. 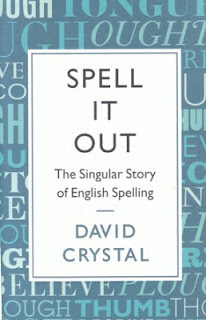 At Amazon they are taking pre-orders for _Spell It Out: The Curious, Enthralling and Extraordinary Story of English Spelling_ which will be available on the 4th June NEXT YEAR!! Do you know how different it will be? Very suspicious. The cover is almost identical with the book we're talking about. It has just eight more places, is hardback, and costs a couple of pounds more. The present book has ISBN and eISBN numbers beginning with 978. The alleged future book has an ISBN-13 number with the same prefix, although it's purportedly to be issued by a different publisher. UK vs US editions? The US Amazon does not have the in-print edition available except through other sellers, many of which are UK, and some Germany. And the edition that's out is a UK publisher, whereas the coming edition is a US publisher. Thanks for sharing. I teach English in Italy and it's always useful to be able to give an explanation to students for seemingly illogical English spelling (when compared to the very regular Italian language). I'll check it out. Looking forward to reading more of your posts.